The PhD Smart Bar is one of a new range of next generation protein bars that taste as good as any candy bar you'd find in the supermarket but with a VASTLY better nutritional spec. Each Smart Bar contains 20g protein and a CRAZY low 0.6g sugar - under a gram of impact carbohydrates! All of this would be irrelevant if the bar tasted bad... but it *seriously* is the best tasting bar of all the low impact carb bars - it's actually hard to pick the best flavour they're all so tasty! 20g Protein - the same amount of protein as you'd expect from a chicken breast or tin of tuna but in an amazing tasting protein bar format. A single bar can easily count as a small meal in a low carb high protein diet. Under 1g Sugar - when you try a Smart Bar you will understand how amazing this is - they seriously taste as good as a chocolate bar that would typically contain 40g sugar at least! 5 Delicious Flavours - With 5 flavours to choose from you won't get bored any time soon! Not sure which to go for? Try a selection in the Echo Pick n Mix! East to Eat - this SOUNDS obvious but if you've had many other protein bars in the past you'll be well aware of teh feeling of chewing for a lifetime to finish one. With the Smart Bar PhD have a bar that can be finished in seconds - it's easy to eat and has none of that chewiness you expect from older protein bars. Who is PhD Smart Bar For? Anyone looking for a DELICIOUS way to up their protein intake! When to Use PhD Smart Bar? In-between meals, as a snack or as convenient post workout nutrition. PhD Nutrition are one of the UK's most popular sports nutrition brands and have a great reputation for producing safe, natural products based on solid scientific research. Quite simply with PhD you can trust the products to be suitable for any athlete. 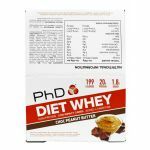 At Echo we have stocked PhD Nutrition for many years and are happy to recommend PhD Nutrition supplements to our customers. PhD Smart Bar should be consumed as part of a varied and balanced diet and healthy lifestyle. Excessive consumption may cause laxative effects. Store in a cool dry place away from direct sunlight.